Margaret Lockwood stars as Anna Bomasch, the daughter of an inventor who is forced to flee to England when the Germans march into Prague, war looming closely overhead. Anna ends up being brought to a concentration camp, where Karl Marsen (Paul Henreid) helps here escape and find her father in England. But the relief of finding refuge in England doesn’t last long. Soon Anna and her father are recaptured and brought back to Germany, where officers (including Rex Harrison as Gus Bennett) attempt to lure Anna into the German cause. Night Train to Munich is a fantastic, bold World War II thriller with a somewhat Hitchcock-ian feel to its execution. The plot is somewhat slow-moving compared to most war thrillers but intrigue and anticipation are very high throughout, making the pacing more of a suspense-building technique than a detriment to the film. A number of surprises and character shifts are revealed along the way, some of which leave the viewer quite shocked, and all of which certainly leave the viewer guessing about where those twists will take the story. But what really makes this film great is the phenomenal cast. Rex Harrison, Basil Radford, and others all give near-perfect performances. Leading lady Margaret Lockwood is impressive. I haven’t seen a terribly large chunk of her filmography, but in the most recent film of hers that I viewed, A Place of One’s Own (1945), her performance bordered on the side of melodrama and had a few over-the-top moments. Here, she’s completely on point. Granted, A Place of One’s Own is meant to be a spooky thriller, which lends itself to melodramatics; but still, she impresses much more in Night Train and is quite believable in Anna’s situation. The actor that really wows here (in my somewhat biased opinion, as I’ve been a big fan since the first time I saw Casablanca) is Paul Henried as the ambiguous Karl. In the beginning of the film, Karl is the man who helps Anna find her father in England. But the audience and the characters soon discover that Karl is not who he seems. Henreid is so successful in both sides of his character. The audience roots for him, is thankful for his existence when he helps Anna escape. But all of the admiration of and high expectations for his character go south when his character takes a turn. 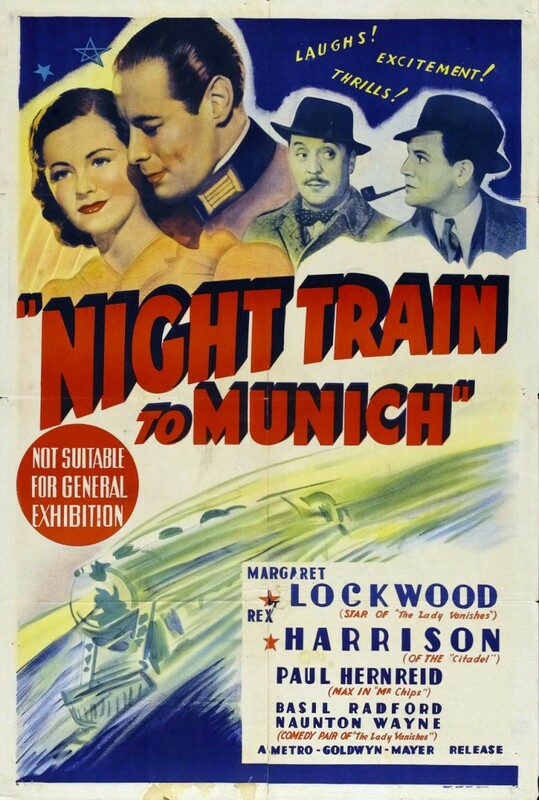 All in all, 1940’s Night Train to Munich is a great war thriller with elements of many other genres (musical, romance, comedy) intermixed. The result is a very effectively entertaining and suspenseful exploration of World War II. The score: 5/5! Previous Previous post: Quick announcement!